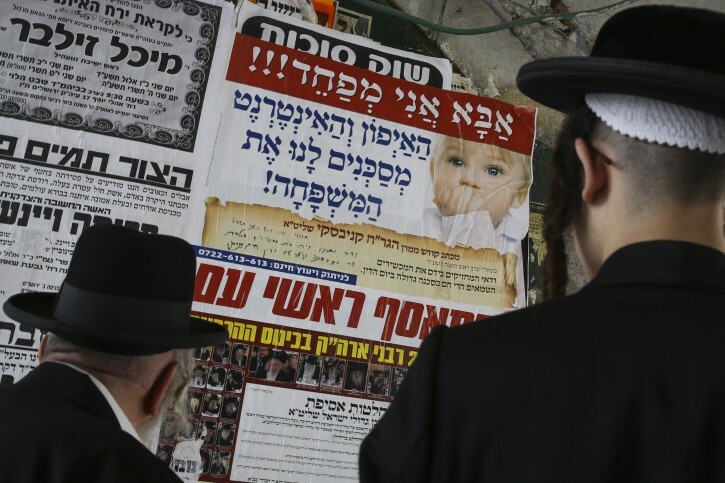 Jerusalem - Despite denouncements and bans imposed by rabbis and religious leaders, many of Israel’s 750,000 Haredim are secretly and increasingly using the internet, according to a new study conducted by Ben-Gurion University of the Negev. Ha’aretz reports (http://bit.ly/1rGvfCx) the study found that a majority of Haredim are using assumed identities or a “nick” – abbreviation for nickname – to browse the internet and are even attempting to guess the real identities behind the so-called nicks of their fellow surfers. The study also found that the Israeli ultra-Orthodox community is surfing online and accessing websites at all hours – as often as less religious Jews – usually from a mobile device since Internet access is forbidden in Haredi homes. The purpose of the study was to “characterize the Haredi surfer.” The findings revealed that Haredim are using the web to “consult with one another, gossip madly and discuss a vast range of topics touching on their community, their thoughts and anguishes, emotions and needs, politics, halacha, and their experiences with peers in the online Haredi world,” behaviors which would be condemned in their real lives. The study concluded that an “internet revolution” has changed the way young Haredim are leading their lives. The charadim have two choices: 1. reject technology (internet) completely or 2. learn to use it safely. This parallel's the charadi society's basic internal problem of either hiding from outside life and its influences or learning to live with it. In America most charidim learn to live with the outside world and balance Jewish life and mitzvot with the negative value systems whereas in Israel most charadim are taught to hide from the outside world. However, in Israel there is pressure on charadim to go out to work, hence there is potential problems for those who can not balance theirselves in view of the negative outside influences. I am of the view that the purpose of Jewish education is to teach young people how to deal with the negative outside influences so that they should be able to go out into the world and not just work, but also influence lost Jewish souls to come back to the fold and observe Torah and mitzvos. SSUSSHH don't tell the world that the super frum are just like everyone else.What happened to genevas daas ( it is forbidden to fool people ) in all situations.I remember hearing how in business , shoddy tefillin,mezuzot and other religious articles were sold abroad ,- for them ,people who live outside of israel it's ok even if it's not kosher.The levush ( style of dress) is important to show solidarity with the crowd but the mind is the most modern. “ The charadim have two choices: 1. reject technology (internet) completely or 2. learn to use it safely. Very eloquently said. Maybe Vin can add Like buttons so that I would give you two likes.